I’m not sure how to start this post. Let me back up and show you a little bit of what’s gone on since Thursday morning when I hit send and “An open letters to pastors” moved from being in my head and heart to being part of the public dialogue. I thought it might do slightly better than normal; it was written from a place of personal experience and a strong desire for things to be better, different, in the most God honoring “why do we settle for so little when we can have so much more” kind of way. Prior to that post, the highest number of hits I’d gotten on one day was 172 –and that was thanks to a retweet from Patricia Heaton of Everybody Love Raymond— back in February. By mid-afternoon I was at 212 and thrilled to have broken my record because several people had said they’d post it on their Facebook page. All told, on Thursday the total number of hits was 525 and I thought the wave had ridden itself out. Friday morning I got up to teach and was stunned that there were 600 hits by 5:45 a.m. I returned from a full morning of teaching to over 2,000 hits (just on that day) and twelve comments from people I didn’t know and who shared parts of their stories. If you haven’t yet, go back and read through the comments, but first you might want to take your shoes off because it’s holy ground. That’s more than 36,000 hits. But wait, there’s more! It was not only the total number of hits that floored me (literally, I had to lie down. I also ate an oatmeal cookie before noon, which was a gesture of celebration.). What humbled me was the global-ness of it. People in 109 different countries read this. Can you even wrap your mind around that? As a shout out to the hours I spent as a kid playing Risk, people in Madagascar read the post! And the Cayman Islands aren’t just in John Grisham novels! Greenland sparked a conversation in the office today (it is, by the way, a part of Denmark). 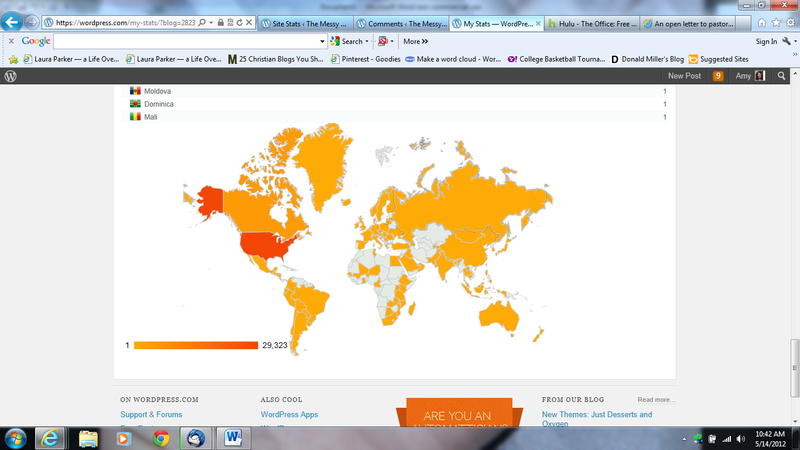 This is a screen shot of the different countries where the hits have occurred. Sunday morning when I awoke and saw the total I started to cry, only the second time in this whole experience. It was a Paul moment (yes, yes, I know that I compared myself to Mother Teresa two weeks ago and now am comparing myself to Paul, but work with me on this). Paul wrote letters and they circulated and those letters were used by God. I wrote a letter and it circulated and it was used by God. Paul, who called himself the greatest of sinners, still used by God. Me, a great sinner, still used by God. To God be the glory. Another very cool piece of this is told by my friend LeAnne. You can read about it here. There is so much more going on in people’s lives and hearts than meets the eye. People want to share their stories, and we need to create space for them to do so. The proverbs are right on. Kind words heal and help; cutting words wound and maim (15:4). And Gracious words are like honey comb, sweetness to the soul and health to the body (16:24). On Saturday I was reading in Psalms (this was the day the numbers were continuing to grow and I kept hitting “refresh”) and the Lord so graciously reminded me: And if your wealth increases, don’t make it the center of your life. (62:10b) Point taken Lord, thank you for the reminder. Wednesday will find us here at The Messy Middle discussing the book 7: an experimental mutiny against excess by Jen Hatmaker. Come back and join in the discussion. Until then, thanks for coming along for the ride. Hi Amy….I don’t think that’s even that half of it. Because when I posted it on my FB page, hoping at least one pastor’s wife would see it, another friend took it another step further and sent it to that pastor’s wife and other pastors in a FB message. She told me this yesterday and informed me that one of those pastors had sent it to other pastors. Today she told me that both of those pastors worked it into their sermons. I was really amazed and touched. The message your wrote touched the hearts of people. I’m so thankful for things that the Lord lets us go through because I know it means he will then use us to help others. Bless you sweet sister! So now because of this “movement” those who are mothers are now robbed of the one day a year when they are asked to stand and be recognized for all they go through just because some people can’t deal with their own pain of being denied that opportunity? Really – so the good of the many is sqashed because of yet something else that “OFFENDS” people. I too struggled with infertility and my husband and I had no success in having children. So I do know that pain. I was a mother when we married – so it isn’t totally the same, but I would never set out on a movement to stop people from honoring others because it made me feel bad and left out. No words – there are just no words for self centered ideas like this one. And it is PURELY egocentric. Instead of asking for it to stop, ask for healing – or look for ways to minister to others, not downplaying the joys of others because they make you feel bad. I was in the middle of blogging and begging when I read your article. It made more sense to stop where I was and post a link. I wish I would have had this before today. My daughter only told me this past week that this happened to her at their church last year and we all chose not to attend church today but went to brunch instead. My husband is a staff pastor and I had been trying to get those who make the decisions to err on the side of being sensitive. I will be sharing this before next year to be sure. I keep thinking about how the majority of these kinds of holidays (Mother’s Day, Father’s Day, Grandparent’s Day, etc.) were started or promoted in the first place by greeting card manufacturers to sell more cards. Seriously. And while there is a good side to the whole idea, I think somewhere along the line it got made into a THING. You called out the THING and laid it on the line, and found a lot of people nodding in agreement. I think that is awesome. I couldn’t leave a comment earlier, but am trying again. I shared your post through facebook and a blog post for the babyloss community that I’m a part of. For two years after my daughter’s stillbirth, I was a mom, with only a grave to tend to. While I’m lucky to have another child here with me now, I know the difficulties that come with holidays. So thank you for your thoughtful inclusion for all women. Super cool, Amy !!! Thanks again….for writing from your heart. Thank you for clearly speaking the heart of many. Amy, I found you through a pastor friend who posted a link to your article. I am a pastor as well, and we look for good writing that really meets life on the road with Jesus. I’m thankful for your insides poured out to voice the darkness many experience … i.e. you brought the light of Christ into the darkness, incarnationally – with Jesus’ skin on. Thanks. Hi Amy…I found you through the other Amy, Amy Lester. I am a mother now, but your post reminds me of the struggles I experienced when I was trying so desperately to become a mother. Mother’s Day was hard, but so many other things were hard too…baby showers, visiting a new mother and holding her precious baby in my arms, and even just seeing a beautiful moment between a mother and child. Thank you for reminding us all that motherhood is a gift and a treasure, and that we must be mindful of the many who desperately want to be a mother but cannot, or those who have been mothers but lose a child. We cannot forget that some people choose not to be a mother, and that is okay. This was my first Mother’s Day attending a new church, and I really appreciated that the mother’s did not stand. I have always felt that have a certain group stand in church is silly…you helped me realize that in addition to being silly, it can also be hurtful. And Amy, did you know that I babysat Christie when she was a wee little girl? I love this connection! I stumbled across your blog last week as I was prepping for Sunday and as a pastor (and a dad) I was thankful for your work and insight. I have always struggled with Mother’s Day due to the many issues you raised-and your words helped me and our leadership team honor God yesterday-so I wanted to say Thank You! May God continue to bless you as you serve in His name….. Thank you for your post. It reached Hawaii so you can add that to your map! I am a worship leader here and we used your preamble during worship. It was a powerful moment that God used to encourage, comfort and bless. Thank you, Amy. Your post struck home. My wife and I have been married 41+ years. We could not have our own children and adopted two boys from Korea. Huge challenges with our older son, and still 34 years later, major life challenges. And so I have been sensitive to the whole Mother’s Day and Father’s Day issue. As a pastor I reflected that sensitivity in our prayers this year. Many of those prayer items you included I included in our congregational prayer. But now, reading your post, I realize that the one mistake I made was having mothers stand. How could I be so blind? Especially when I was consciously trying to reach out to those whose Mother’s Day is not happy, with lots of family gatherings etc., or for whom Mother’s Day is not. I still have so much to learn. Thank you for writing, Amy. Thanks for your insight about Mother’s day and the beautiful litany you wrote about mother’s in all forms and stages of life. How can I get permission to use it next Mother’s Day in our church service? I’d love to begin our service with this litany having the leader read and the congregation respond with the parts “we remember with you, we stand with you” etc. I know it would be very powerful. Thank you for starting a discussion that will help us better honor the women around us. Wow, that’s a ridiculous amount of hits. I’m glad that it touched so many people!